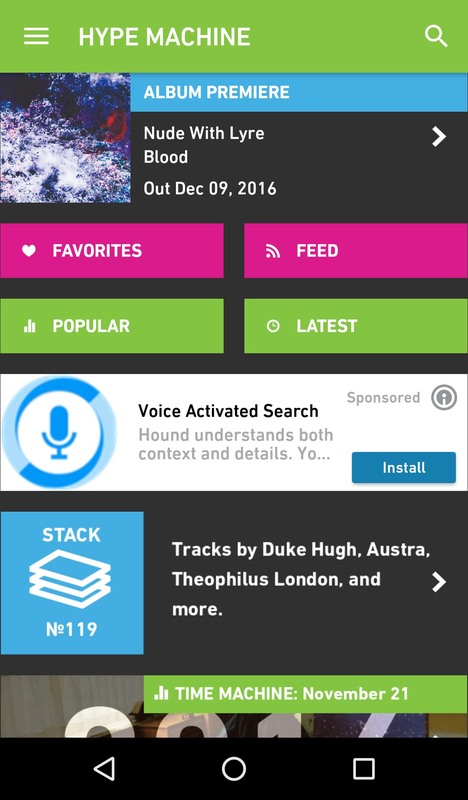 This past Friday, December 2, 2016, we enabled ads in our Android app. We released Hype Machine for Android in October 2014 as a $3.99 premium app. The revenue from these sales allowed us to publish many updates, including a full rewrite, maintaining the app as the Android platform underwent rapid changes. Unfortunately, we were not able to generate enough sales to support our small team and continue development. Unlike many other online services, we don’t have outside funding. Hype Machine is a straightforward business – we get revenue from advertising and invest it into making products for music listeners. We understand that it’s frustrating to have paid for the app and now see ads on your screen. Though the app became free in April, we’ve waited until December to introduce ads as a small sign of our appreciation of your earlier support. Whether you bought the app years ago or months ago, we hope that the music it’s brought into your life has been worth it. In the coming months, we’ll be working to make sure the app continues to help you discover new music while keeping the ads as unobtrusive as possible. I wish we could provide an ad-free experience, but we simply would not be able to continue maintaining the app without this revenue. We considered many options before introducing ads in our apps, and there are many reasons why subscription/donation/IAP offers were not workable for us at the time (for example, supporting two product experiences is tough for a team of three people). Given the strong show of support for an ad-free solution since the announcement, we are looking into ways people could remove ads in the apps. If you are interested, sign up here. Ads in our mobile apps have been temporarily disabled. Thanks for the update and the transparency. As a long time listener who purchased the app, I’m happy to support a service I’ve used for many years and glad that you have found a way to continue developing the app. Cheers! I don’t understand why you don’t give the users that purchased the app a premium option that disables ads. This is a pretty common feature in apps featuring ads, and would show a bit of loyalty to the people that supported this from the get go. Paying $4 for an app with ads is a joke. You might want to update the app screenshots to include the new ads. As a long time user of Hype Machine, it’s pretty disappointing you guys feel this is the only option. I use the site throughout the workday. I use the mobile app on the way in and on the way out of the office. You guys should have considered Google Play Monthly/Annual App Subscription model so long as it’s priced correctly (i.e. not competitively). I would have gladly supported since Hype offers an amazing experience. The only thing bad I can say is that it didn’t get released at the same time iOS was released. Although I’m not a user from the Class of 2005, I think it should be time to pay my dues. Please discuss the following with the site operators: Have the guys who did a great job putting the Android app together look me up on LinkedIn. If they think I might be a good fit, please consider the possibility as considering me as a FREE resource to help with bug fixes and small feature/upgrades. I’d be more than happy to donate a few development hours a month to see the Android app go back to being ad-free for at least the paid version. I’d be willing to review & sign legal documentation to protect Hype’s intellectual property. If this is a conflict of interests or the situation is much larger than I should be allowed to understand, I take no offense if my offer is declined. Frankly, you could’ve easily followed the outline that most other apps do which is allowing all paid users an ad free upgrade while keeping any new non-paid users as ad supported. It’s obvious the route chosen was because you feel that you wouldn’t be able to obtain enough users for ad supported without forcing pre-existing users. Overall this is a disappointing decision. I’ve been using HM since 2009 — normally I would be upset about the imposition of advertisements on a platform that I paid for, but I’d rather the Android team keep up their dedicated work, even if it means losing some space on the home page. While new features are far and few between, most of the bugs that I’ve encountered on the app have been cleared out over the past few years. To whomever it may concern: thanks! Things like buffering (download?) processes failing to initiate was really annoying. 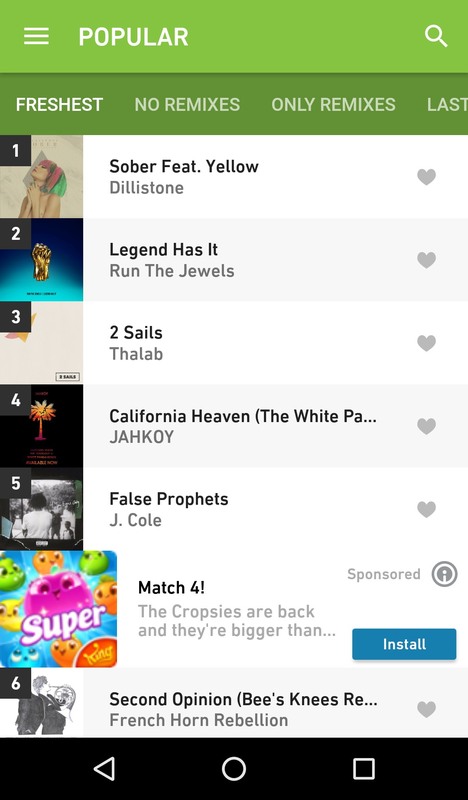 As long as the inclusion of advertisements on HypeM includes basic courtesies to users (e.g. not tracking location or activity data for sale to third parties), I think this is a fair price to pay for continued support. Please develop an ad free version, I’ll pay for the app again/more if need be. Give us options don’t just forces us into going along with what you feel is best (especially when the majority feels it’s not). Just wanted to say that I’m happy to support hypem and I appreciate transparency around the ad update! I’m a user who has bought a SoundCloud subscription thing so that I can use hypem with my Sonos. I wonder if you’ve ever considered a monthly membership that might cover 1) Sonos and 2) ad free experience on web / mobile? I would easily be willing to pay monthly for some kind of “premium” experience that covers these things! I paid for the android app and don’t really mind if you add adds if development continues. Feedback – I still get a bit of buffering/being stuck loading when moving between wifi and 3g which I do a lot when listening (mowing the lawns etc). Been using this app since 2009. Really love the transparency in this message. Ads aren’t too much of a problem now but premium members who purchased the app should have some kind of grandfather deal or having the app become ad free down the line. Makes the customers feel appreciated for actually supporting this app pre-ads. Keep the ads out of the listening experience and we won’t have any problems. Been using hype since 09 and what has always truly separated it from other free music services is that the ads don’t interrupt the audio. That’s your value prop. Don’t lose sight of it. I tested some early builds of the Android app, bought it as soon as it went up on the store, and then basically couldn’t use it for a year because they didn’t bother updating it for Marshmallow. I think it went about 16 months without an update and super dodgy performance. Now the app is free and the early adopters don’t get so much as an option to disable ads. It’s been said before but I wouldn’t mind paying again for the option to remove ads. Do you guys really get that much money from paid ads that you would prefer forced ads over a pay-to-remove or subscription model? Huge supporter. I totally understand where you guys are coming from and understand it costs money to produce a good product. keep up to great work. And know you have customers out there that would pay to subscribe if MRR is a better option. $4 for an app with ads, as others said, is a joke. I work in mobile app UA and advertising, and this is a horrible practice. You give users the option to disable ads if they’ve paid. See: Google music. You also let them donate if they feel like it by notifications on In-App messaging. See: wikipedia. You also let us know BEFORE, not after with a nice PR message. See: these replies. You look at alternative streams of revenue, such as premium accounts for bloggers or musicians. See: soundcloud. You control the ads so we don’t see goddamn Amazon ads every time, but instead see njcely formatted and relevant ads. See: Zedge. Go back to the drawing board! I’m sure you can come up with a nice press release that says you’ve decided to reformat this monetization push. We love Hypem, and none of us care about $4. Make it an annual subscription and we’ll gladly pay. @Anthony – Thank you for listening. Your Android team should look be looking into supporting different build flavors that makes writing the code once but can deploy a paid apk or free apk using the same codebase. Some of the top app experiences are run by a team of two, so you guys are well ahead in that. It’s not necessarily a matter of throwing more bodies at the problem. It’s better to work smarter than harder. The idea of IAP is great. You should be charging a high premium in features like offline support, no ads, 3rd party integration, chrome cast, etc. Veteran users like myself would love to spend money or better said, show our support on the things we use the most. But at the same time, the bar has to be low enough to get new users to become active users. Users who purchased your Android ate the sting of you going free on them. Now is a perfect time to give back to these users with an ad free option. I don’t want ads in my stream…ever. Ugh this is the worst. I paid for this app, I don’t want intrusive advertising ruining the experience. I will even give you more money to take the advertising way again. I joined Aug 21st, 2009 and hypem has brought a lot of value to me by giving me tons of new music. I also pay for subscriptions basically on every service so that I am never exposed to advertisement. I would gladly do the same for hypem (though I refuse to pay for Soundcloud since they terminated my paid account and I lost all the music I made lol). Please don’t go the way of Soundcloud or the dodo bird! So sad… I’ve been a fan for over 6 years and I was considering to purchase the app but reading all of these comments have now scared me away. I understand that you need to make some cash but like previous comments, maybe ads for those who don’t pay. I totally understand where you guys are coming from and understand it costs money to produce a good product. keep up to great work.